About nine or so years ago I watched a webinar for the first time. I can't remember exactly what the webinar was about (it was something about Second Life), but I do remember thinking that I didn't get "it." After that I watched bunch of free webinars about all kinds of things because that's what I thought I should do to be a modern teacher staying current in his practice. Finally, in late 2011 I paid to join a webinar and something weird happened, I got a lot more out of the experience. Since then almost every webinar I've attended, both free and paid, has been a good learning experience. 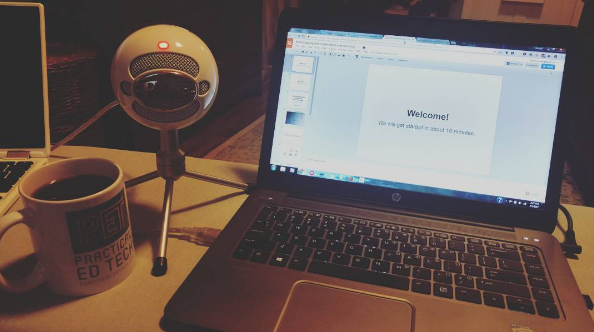 Here's what I figured out about learning from webinars. 1. Participate in live webinars, don't just watch them. Every webinar platform has some kind of chat or Q&A feature. Use it! Use it to ask the presenter questions. An experienced webinar presenter will be able to handle questions in realtime. Don't be afraid to ask clarifying questions. Even when I'm attending webinars about things with which I'm already familiar, I make an effort to think of questions to ask. This forces me to tune-in and listen with more focus than if I was just listening in the hopes that something said by the presenter will jump out at me. 2. Close Facebook and take notes. If I cannot attend the live version of a webinar, I still find great value in recorded webinars. When I watch recorded webinar I focus on it the same way I would during a live session. That means closing Facebook and taking notes in my notebook. In that notebook I write the questions that I want to send to the presenter via email. 3. Act on webinar ideas quickly. When I participate in a webinar my participation isn’t over until I actually act on what I was just taught. Just like in a traditional classroom setting, it’s important to try for yourself what was just demonstrated for you. Do this as quickly as you can. If you’re ready to try learning through webinars, take a look at the online courses that I'm offering this summer. And if you're a subscriber to the Practical Ed Tech Newsletter, check your email for a discount offer that was sent on Wednesday.